As the bitterly cold weather approaches, people are likely to feel hungrier according to psychologist and comfort food expert, Dr. Susan Albers. Here are 7 ways to manage your appetite when it is really cold outside. Don't be surprised if your appetite goes up as the temperature goes down. As the temperature drops, don’t be surprised if you notice changes in your appetite. Cold weather tends to make people feel hungrier according to psychologist and comfort food expert, Dr. Susan Albers. The body processes food quicker when it is chilly, therefore, making you feel hungrier. A study on swimmers found that their calorie intake after exercising in cold water was 44 percent higher than when they swam in warm water. For our ancient ancestors, it was difficult to survive in cold weather thereby kicking off a natural instinct to forage for food during hard times. Food provides calories which in turn keeps you warmer. 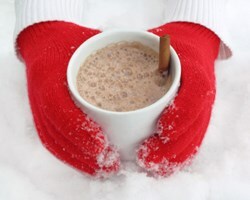 Enough calories are needed to ensure that the body is able to perform all of its normal functions and to keep warm. Therefore, there are some deep biological roots to changes in appetite during artic-like weather. The other reasons for a boost in appetite may be more psychological in nature Dr. Albers explains in her book, EatQ: Unlock the Weight Loss Power of Emotional Intelligence. When you are stuck inside for long periods of time, it’s tempting to reach for comfort in the form of grilled cheese, hot tomato soup, and warm casseroles. These foods often tap into early childhood memories. Also, consumers tend to purchase more food right before snow storms and extreme weather conditions. Therefore, one may have a surplus of available food to snack on while waiting out the weather. 1) Buy “Just Enough.” If you stock up on groceries, be sure to purchase staple items like milk, bread, fruit, and vegetables. Avoid buying too much by carefully gauging how long the bad weather is likely to stick around. Mindfully buying food sets you up for success! 2) Drink Up. Hot beverages can go a long way in warming up your body as well as preventing comfort eating. Stock up on hot tea, warm cider, sugar free cocoa and coffee. Stir with a cinnamon stick. 3) Chicken Noodle Soup. If you tend to reach for soothing food on cold days, a study published in Psychological Science found an association between chicken noodle soup and feelings of comfort. The good news is that chicken noodle soup has many nutritious benefits and tastes great on a chilly day. 4) Make it Hot. Spicy foods not only give the perception of being warm but also raise your temperature a notch or two. Cook a pot of spicy, turkey or bean chili. This dish has a lot of fiber to keep you fuller. 5) Layer Up. Warm up by layering clothing, cocooning in a blanket, sitting next to a fireplace or taking a hot shower. Thirty minutes of indoor movement, an active game or exercise equipment can also help to keep your body warmer and prevent you from feeling hungrier. 6) Push Back the Curtains. Sit near a window or turn on a bright light to boost your serotonin, the feel good chemicals in the body that manages your mood and helps prevent comfort eating. 7) Be Mindful of Comfort Eating. Before you eat, ask yourself if you are really hungry or not. If you think you are emotionally eating, try distraction or connecting with someone by email or phone. For those who do end up digging into comfort foods, eat mindfully! Savor each bite slowly. To learn more about comfort eating, take an Emotional Eating Quiz and download the Mindful Eating Pledge, go to http://www.eatq.com or "Like" us on http://www.facebook.com/eatdrinkmindful. Dr. Susan Albers is a psychologist and author of six books on mindful eating including her latest, EatQ (HaperOne, 2013), Eating Mindfully and 50 Ways to Soothe Yourself Without Food. She is frequently quoted in Shape, Fitness, Self, the Wall Street Journal, the New York Times and other publications. She was a guest on the Dr. Oz TV Show.